How to Prepare for the CA Foundation Course(Six-Month Plan)!!! How to Prepare for CA Foundation Exam(Six-Month Plan)!!! Most of the students are juggling with the question on how to prepare for CA Foundation exam. 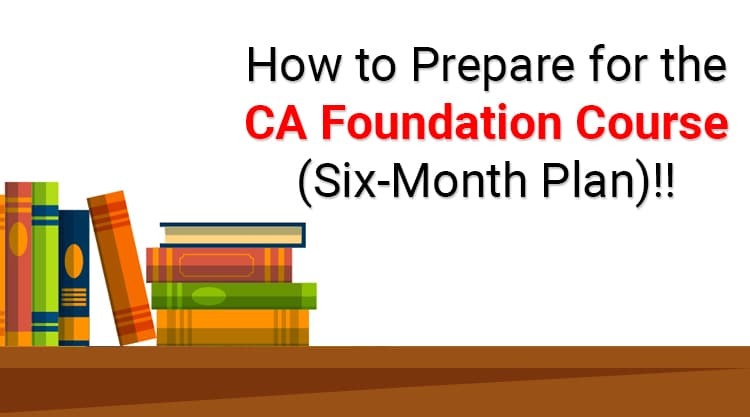 If you have the same question troubling then you are on the right article as here we will tell you some important tips on CA Foundation preparation. The same ideology work on preparing yourself for any exams.which means that the major portion of you study time should be spent in making a strong fundamental and theoretical aptitude and then when you start working on practical problems, it will be an easy task. In this article, we will try to help you in preparing yourself for CA foundation exams for June 2019. We have identified two approaches that can help you to channelize your energy and time in a proper way to make success inevitable. One of the approaches deals with psychological balance which helps you, to keep yourself positive and focused throughout your study period. The other approach is more practical, which analyze the subject, course, assessment pattern and infuses your study time, accordingly. How to Prepare for CA Foundation Exams ?? First, Let’s Discuss How We Can Maintain Physiological Balance Throughout Our Course. We advise you to cultivate reading habit throughout your course. Reading newspaper, a business magazine or even books by an economist on any subjects on business and economics is an interesting way to keep yourself updated, and this habit will surely make you more confident. Once you are in the proper mindset and proper health, half of the battle can be assumed as” already won”. The next Approach is the practical one which involves following practise. Identifying Your Weak and Strong Points and Managing Your Time to Sharpen Your Skill in That Particular Area. ICAI has introduced a new learning scheme, which emphasis on developing technical and analytical know-how to match with international standards. CA foundation exams are held twice a year in the month of May and November. Where Principle and Practice of Accounting, and Business Mathematics and Logical Reasoning are subjective papers, and Business and Commercial Knowledge, and Business Correspondence and Reporting are a quantitative one. We will further discuss how to prepare for the CA foundation for practical and theoretical syllabus. We suggest students make one register for all the theoretical aspect of the subject. We suggest students make charts of formulas, laws, depreciation rates, tax slabs, ratios and can paste it on their wall. The practical subject requires the practice of both complex and non-complex problems on a daily basis. Solving Lot of sample paper, mock test paper, and previous paper will surely help you to acquire expertise and confidence in your subject. The application part of every chapter can be questioned with verbs like examine, identify, calculate, reconcile or solve. Students should answer to as many questions of such behaviour, of each chapter. For more complex problem. a student can try solving compare and contrast questions from the chapter. We are suggesting a 6-month timetable for students that can help them to cover their syllabus of CA Foundation 2019 in a given period of time. We suggest every student analyze their own knowledge and behaviour and can use this timetable to organize their time, with necessary amendments. Q 1 Is it important to practice through previous year question paper? Ans: Yes, it is important to go through previous papers mock test paper, sample paper, of same ICAI approved syllabus. Q2 How to study in the first two months of preparation? Q 3. How To study in the third and fourth month of preparation? Ans: Third and fourth month are the most crucial time of your CA Foundation preparation. During this time you have a proper understanding of your subjects and you start the application of this knowledge to solve problems. You should give more practice time during these months. You can refer to the table above for further classification. Q 4 How to prepare for the CA foundation in last month? Ans: Please refer to our article CA Foundation last month preparation. Q5 How to prepare for the CA foundation without coaching? Ans: It is possible to prepare CA foundation without coaching. You can refer to the article above for help. It is advisable to study under experienced guidance. Hope you have got the answer of how to do CA Foundation preparation in six months. If you want to know more about CA Foundation exam pattern and marking scheme, please read our article- CA Foundation exam pattern. Keep yourself healthy and organized.